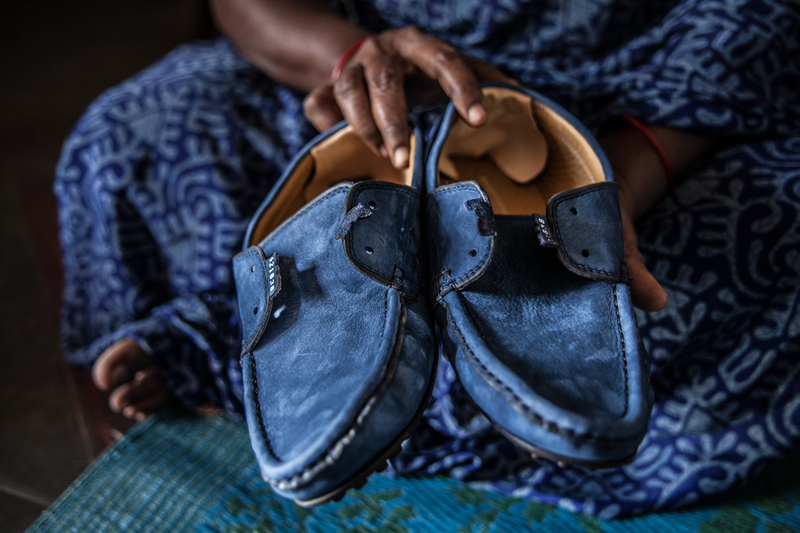 Our new report, ‘Stitching Our Shoes’, uncovers the grim reality of homeworkers in India, the invisible female workforce who stitch the leather uppers of shoes bound for sale in the UK. 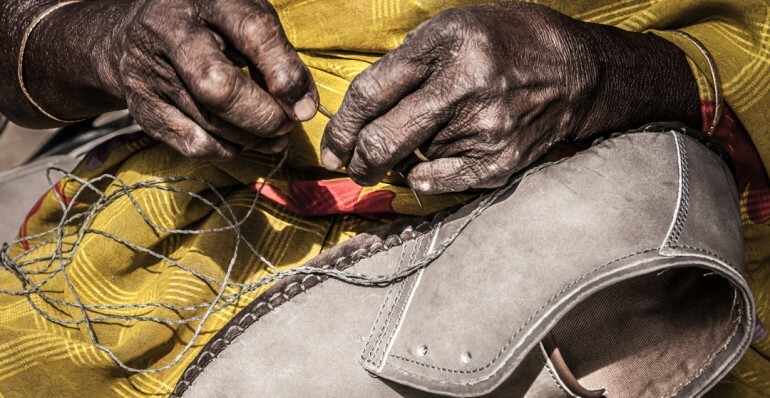 The shoe industry is an immense global business, with over 24 billion pairs produced last year alone, equating to three pairs of shoes made for every single person living. The UK is a key part of this industry as one of the largest footwear markets in the world with, on average, each person in the UK buying five pairs of shoes per year. Complex global supply chains mean that tracing a pair of shoes from the shop floor through the factories, homes and tanneries in which they originated is virtually impossible. A lack of regulations allows this multi-billion pound industry to continue to operate without transparency. Issues with workers safety and poverty wages abound in an industry built on exploitation, however those at the bottom of the chain are homeworkers. These are the ‘invisible’ women who stitch leather uppers in their home, earning next to nothing, with no security or benefits. There are thousands of women working as homeworkers in the leather shoes industry in India alone. Stitching just one pair of uppers could take her up to one hour. For this work she will earn the equivalent of less than 10 pence per pair of leather shoes, far from a minimum wage let alone a living wage. This is back-breaking labour-intensive work that requires the precision of hand stitching instead of a machine. The work often leaves women with health issues and complaints such as hand numbness, eye strain, back problems, and skin rashes from chemicals used to dye the leather are all commonplace, and unlike their factory counterparts, homeworkers have no health insurance to allow them to seek medical attention. Homeworkers receive a bundle of leather uppers to be stitched by a factory middleman each morning. The middleman returns that evening to collect them and to pay her piece rate poverty wages for each pair she stitches. There is no guarantee there will be more work the next day. They provide the flexible and cheap labour demanded by the shoe industry. We completed the work we had yesterday. We may or may not have work tomorrow. There is no job security. 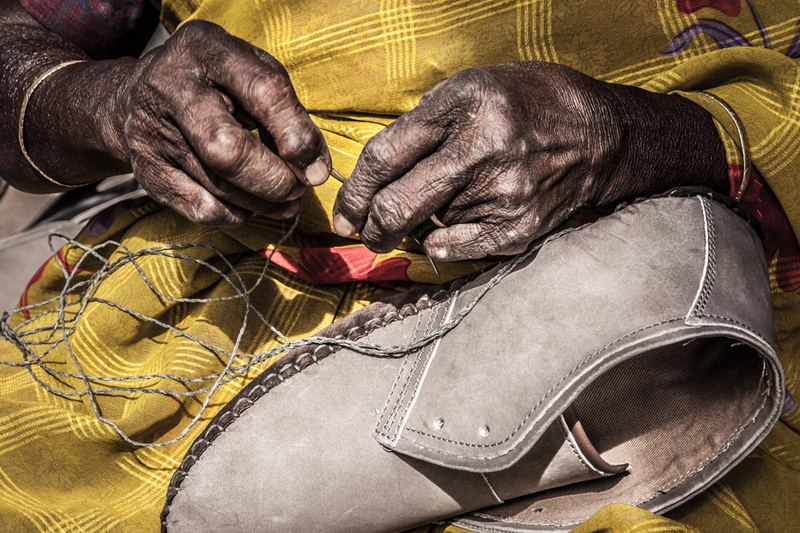 Sumitra, leather shoe homeworker, South India. Homeworkers are often women from the lowest social strata or class, who have very few other options available to them. Due to gender divisions, they may feel restricted to home working to enable them to also complete their unpaid domestic duties, such as looking after young children or elderly relatives. Due to the isolated nature of their work, it is difficult for homeworkers to organise and collectively demand their rights. In many cases they do not know which brands they are producing for. We have nothing. That’s why we know this is employer exploitation. We have no other way. That’s why we are involved in this (work). If I had any other income, I definitely wouldn’t do this. Shanti, a homeworker from Tamil Nadu, India. What should shoe brands do? All shoe brands should publicly map their supply chains, from the processing of leather to the final product. This should be done in a transparent way, in collaboration with other companies, trade unions, NGOs and workers. Homeworkers should be recognised as part of the supply chain, and given equal treatment to other workers including rights to a living wage, health insurance, other forms of social protection, health and safety in the workplace, security of employment, and to organise collectively for their rights. To find out more, please read the full report. This report is part of the Change Your Shoes campaign and has been produced with Labour Behind the Label, Homeworkers Worldwide and Cividep.